where o is the mean stress in the two-dimensional stress system = |(<ti + o2) — position of centre of stress circle. The relationship is thus identical in form to the three-dimensional equivalent with 2 replacing 3 for the iwo-dimensional system. 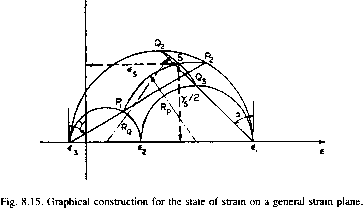 Again, therefore, the single-circle construction applies for both stresses and strain provided that the axes are offset by the appropriate amount and a scale factor for strains of 2G is applied. The following procedure enables the determination of the direct (er„) and shear (r„) stresses at any point on a plane whose direction cosines are known and, in particular, on the octahedral planes (see §8.19). The construction procedure for Mohr's circle representation of three-dimensional stress systems has been introduced in §8.4. Thus, for a given state of stress producing principal stress <ti, 02 and 03, Mohr's circles are as shown in Fig. 8.8. (1) Set off angle a = cos 1 / from the vertical at o\ to cut the circles in Q2 and Q3. (2) With centre C1 (centre of o2, 03 circle) draw arc Q2Qi. (3) Set off angle y — cos-1 n from the vertical at <73 to cut the circles at Pi and P2. (4) With centre C3 (centre of o\, o2 circle) draw arc P\P2. (5) The position S representing the required plane is then given by the point where the two arcs Q2Q3 and P\P2 intersect. The stresses on this plane are then os and xs as shown. 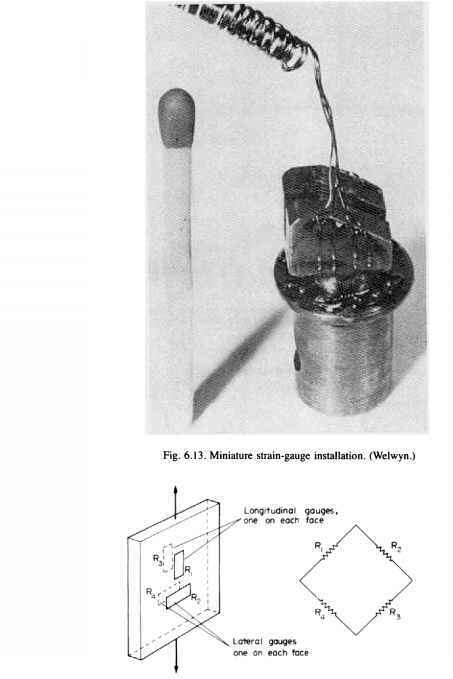 Careful study of the above'construction procedure shows that the suffices of points considered in each step always complete the grouping 1, 2, 3. This should aid memorisation of the procedure. (6) As a check on the accuracy of the drawing, set off angles p = cos-1 m on either side of the vertical through o2 to cut the a2(j-$ circle in T\ and the o\o2 circle in T3. (7) With centre C2 (centre of the ata3 circle) draw arc Tf 73 which should then pass through S if all steps have been carried out correctly and the diagram is accurate. The construction is very much easier to follow if all steps connected with points P, Q and T are carried out in different colours. The construction detailed above for determination of the state of stress on a general stress plane applies equally to the determination of strains when the symbols a\, a2 and <73 are replaced by the principal strain values £1, £2 and £3. Thus, having constructed the three-dimensional Mohr representation of the principal strains as described in §8.4, the general plane is located as described above and illustrated in Fig. 8.15.